This carrot cake is one of the best! Seriously. If your carrot cake hasn't met spelt flour you are in for a treat! 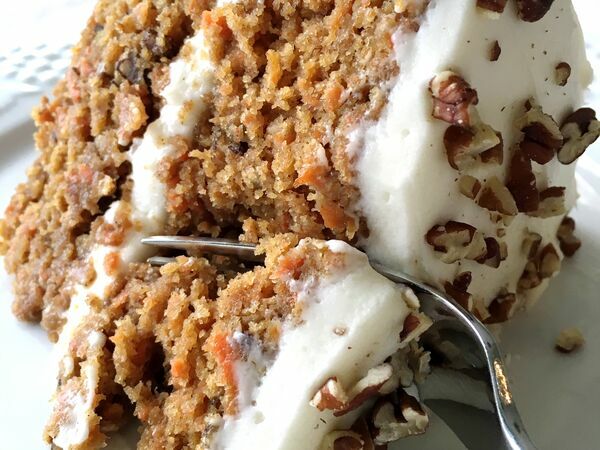 Not only is this recipe amazing, it’s also one of the healthier carrot cakes! 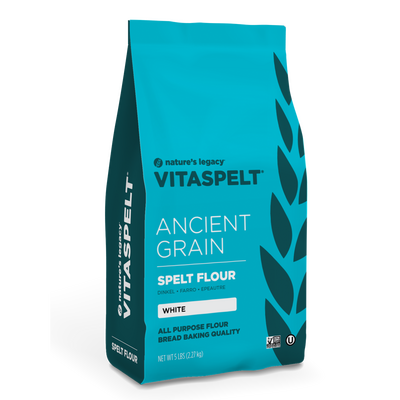 It’s made with spelt flour and almost a pound and half of carrots - the butter has been taken out and replaced with a little oil and applesauce. The resulting cake is moist and delicious, no one will ever have a clue that this cake wasn't made with butter. It has a wonderfully rich bite, filled with carrots and pecans, the spices creating a lovely balance between savory and sweet. A carrot cake of course has to have decadent cream cheese frosting. My stand-by is always this Martha Stewart Cream Cheese Frosting - it makes a ton allowing you to be super generous when frosting your cake. Yes, the frosting is most decidedly not healthy, but a better for you carrot cake more than evens the score. Hey, it’s all about balance when it comes to cake. And forget coffee cake and cinnamon rolls - this cake is the perfect excuse to have cake for breakfast!! That is, if you have a slice or two left over!! Butter and flour two 9 inch round cake pans. Set aside. Shred the carrots using your food processor. You’ll need about 1 ½ pounds of carrots to get two cups. After they are all shredded, empty carrots onto several layers of paper towel and squeeze out all the excess liquid. Set aside. Toast pecans (about 7 minutes in your oven) and chop. In a large bowl, whisk together the white and brown sugars then add vanilla, eggs, oil, applesauce and mix together. Whisk until very few lumps of the brown sugar remain (ideally no lumps will remain but this is hard to do). In the bowl for your stand mixer combine spelt flour, baking powder, baking soda, ginger, cinnamon, nutmeg, clove, and salt. When combined, add the shredded carrots and incorporate fully into all the flour. While your mixer is running on low, pour in the liquid mixture. When the liquid is mixed in add in the nuts. Pour batter into prepared cake pans. Bake for about 35 minutes. A toothpick inserted into the middle of each cake should come out clean. 1. Make cake ahead! You can bake the cake layers one day and then assemble and frost the next. 2. Do a crumb layer when you frost the cake, it makes all the difference in the world. After you have your layers together, apply a thin layer of frosting over the top and sides then refigerate for about 20 minutes. This allows you to then apply a nice thick layer of frosting without getting any cake crumbs getting into the mix. 3. 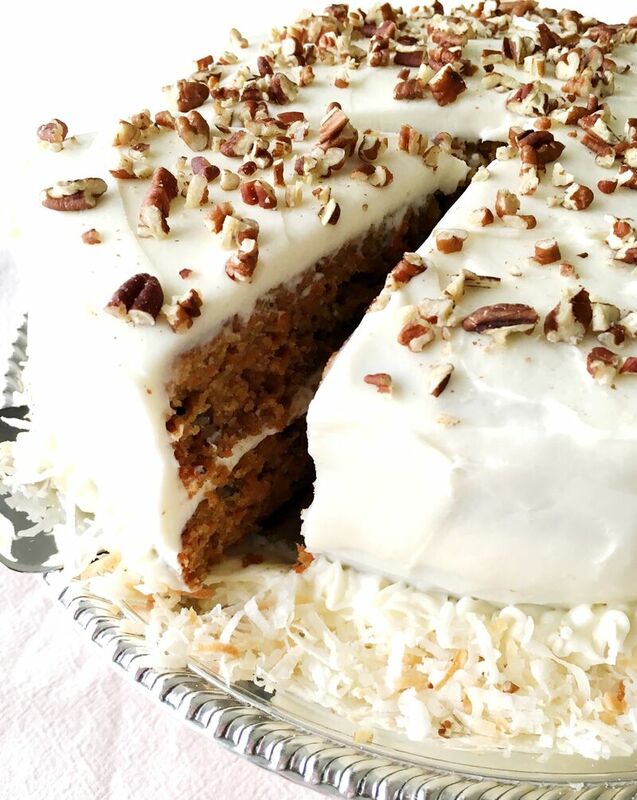 Top cake with more toasted chopped pecans, whole pecans, toasted coconut - create beautiful carrot designs with frosting - whatever you want!